This recipe is a favorite spread or hors d'oeuvre in my house, even though it was never intended as such. 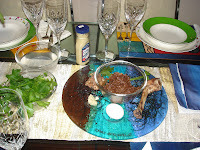 In fact, this started out as a Passover recipe for my Seder plate and evolved into something that I enjoy year-round. I was raised in the Ashkanazi (of Eastern European descent) Jewish tradition, where Charoset, a traditional Passover food, is always made with apples, walnuts and wine. I always enjoyed eating Charoset this way and never thought of making it any other way until I met my husband Brad, who has some Sephardic Jewish relatives on both sides of his family (Sephardic Jews include those from various Middle Eastern countries, as well as Greece, Spain and Morocco). I learned that making Charoset with dates is actually a pretty common Sephardic tradition. It happens to also be a delicious recipe. After making it for my family this past spring when we hosted a Passover seder, I decided to make the recipe again (after Passover had ended) and served it on crackers with Humboldt Fog goat cheese, that we purchased at nearby Bierkraft. This wound up being my husband's favorite snack! The combination of the Humboldt Fog with the dates is a dynamic duo. 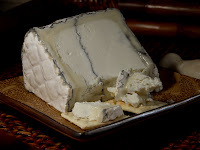 Another note here: if you like goat cheese, you must try Humboldt Fog - it is absolutely my favorite cheese, and is a thousand times better than any ordinary goat cheese. Here's the recipe for the spread, which is quite simple, thanks to my mother-in-law, Lynne. 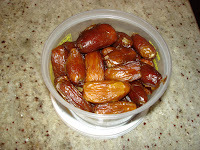 Soak the dates and raisins in the water for about half of an hour. Bring to a boil over medium high heat in a saucepan. Simmer for 30-60 minutes, stirring often. Keep simmering until this gets to the consistency of a chutney. When it is done, allow it to cool to room temperature. Then add the wine and cinnamon and puree in a food processor. Serve with Humboldt fog, on a water cracker. The leftovers store well in tupperware. Note: All photos are my original photographs, except for the photo of the cheese from the public domain, available at http://www.pdphoto.org/. Unfortunately, I forgot to take a photo of the spread served with the cheese and crackers, but below is a photo of it on my Seder Plate.